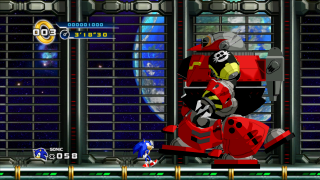 The final boss of E.G.G Station Zone and Sonic the Hedgehog 4 Episode I sees Robotnik revisiting the Giant Mech he deployed in Sonic 2's Death Egg Zone. When Sonic finally clears Eggman's other boss machines again, Sonic chases the doctor in a very familiar scene and Eggman leaps into his redone Giant Mech. The attack pattern is the same as before, with Eggman walking, flying, and even shooting his arms the same as in Sonic 2. But this isn't a direct copy of the Giant Mech from Sonic 2. After 12 hits, the machine starts to malfunction. With electricity flowing all over its body, direct attacks are useless. The boss starts jumping at the player, leaving only small windows of opportunity to avoid him. The only way to attack the boss at this stage is to wait for Eggman to fire one of his arms (which also changes its trajectory now). After the arm flies at you, it will slowly descend and land on the playing field near your position. You can attack the arm while it is descending, however this is risky as the arm still has electricity flowing over it and you could be hurt instead. Once it is on the field and the electricity around it has ceased, hit the arm a few times to fling it at the Mech. If you manage to fling the arm properly, the Mech's electric field will suddenly shut down for a moment. This is the only time when it is possible to attack him in this stage. After even more hits, the shooting arm will descend faster, and he will start shooting lasers and firing small energy blasts sporadically. During this time, it is possible to get all 12 hits on the 1st time when he fires his arm. When you get hit when you fling the arm at the Mech, go under the Mech, and repeatedly jump. You will get hit a few times, so make sure you have some rings! After 12 more hits, he goes into Pinch Mode. After 24 hits, the Mech will fly up again, only this time Eggman's target will fly around wildly and a warning siren will sound. Wait for the target to link to Sonic, then evade immediately. Eggman's Mech will fly down at full speed and smash the floor. If the player is on the ground, they will be frozen by the shockwave for a brief moment. If Sonic hits him one more time before the floor crumbles, the fight will be over and Sonic will escape the Station. If Sonic waits too long and the floor crumbles underneath, it's a one-hit death move, and you will have to do the fight over again. This is similar to Egg Viper's final attack in Sonic Adventure.